Play music instrument was becomes one of my hobbies especially play guitar. Not as great as pro but at least I can play what I like to play LOL. Not only just learn and play the instrument and developing the skill. I also learn how to make music. Composing, arrange and mixing. Yeah! I know, Mixing is the hardest one to learn. And when it comes into learn of making music nowadays, it will goes into something digital. Luckily we are the generation who live in this digital era that can make music from home using our computer. Not like in the past or like in a big professional studios that everything’s was analog. And need a bunch of gear like compressor, Analog tape, Mixer board etc to record a premium track. Nowadays to record your music from home, what you need is your computer desktop/laptop. It doesn’t matter if you are Mac or Windows user. You also will need an Audio interface, Speaker monitor or studios headphone for recording & mixing. And of course the instrument; Guitar, Bass, Mic. And you are ready to rock n roll. 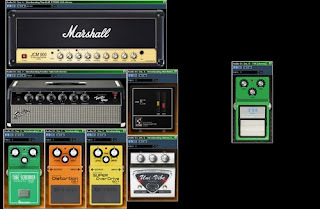 In this post, I make a list of free VST guitar amp simulator that you can try on your mix. Or just for jam and play along with your computers. Some of these vst plugins I’ve try by myself, some I even use for my main guitar amp sim on my project demo’s. And yeah! These free plugins sound killer too! If you want to save budget because you already spent too much money just for buying premium plugins. This list may help ya to reduce the costs. Here they are! This plugin is my favorite ones and yeah! this is what I am talking about the plugin that I use for my demo. Believe me with a match cab IR it will sound really really good. Still by LePou plugins, this a preamp sim roughly based on a famous German gear. It has 2 channels and 2 modes per channel. Each channels/modes share the same features. Apart from the usual tone controls (drive, low, mid, high and contour), each channels/modes offer two different tone stacks that can be accessed via the focus switches. Bottom and bright switches can be used to boost the low and the high frequencies respectively. LeXTAC was amp simulator inspired by a great Californian boutique amplifier. For more info and to download the plugin check here. LeCto is a guitar amp simulator inspired by an american modern high gain head (Mesa Boogie). This amp simulator has 2 channels with 3 modes on each channel. It can go from crunch (raw mode) to modern high gain (modern mode). Find out more about LeCto amp sim and to d ownload the plugin here. POWER – Power ON/OFF. HQ – Oversampling ON / OFF. Use OFF to reduce CPU usage, use ON to get the quality sound without aliases (more CPU). GAIN – Determines the amount of gain applied by the Pre Amp. POWER AMP – Determines the amount of gain applied by the Power Amp. Amplifikation Lite allows you to create ultra-realistic sounding guitar sounds. Simply plug your guitar into your computer’s soundcard input. And you’ll get high-quality guitar tracks with a simple interface. Amplifikation Lite’s DSP engine is based on one of the amps featured in Kuassa Amplifikation One with a fixed tonestack and power amp output type. If you love Marshall JCM900 sound, you will definitely love this plugin. In this plugins bundle you will get not only the amp sim but you will get the Tube Screamer and some pedals simulator and Fender Mustang amp sim too! Check this out at requietus.blogspot.com for more info and to download the plugins. PS. Unfortunately this bundles only available for 32bit windows based system only. If your installed DAW is 64bit version use VST bridge to use this plugin. These amp simulator need Impulse Response (IR) loader in order to use. You can use NadIR, keFir or LeCab by LePou plugins. You can also use Overdrive pedal simulator such as TSE 808 by TSE Audio inside your track signal chains in your DAW to boost the Amp sim. Okay! that’s it! If you enjoy what you read you can share it with your friends. Thanks for read anyway! and hope this post is useful. Cheers!